Penned by Andrew Pollard, Martin Berry’s panto for Queen’s Theatre Hornchurch is a rather by-the-numbers affair. 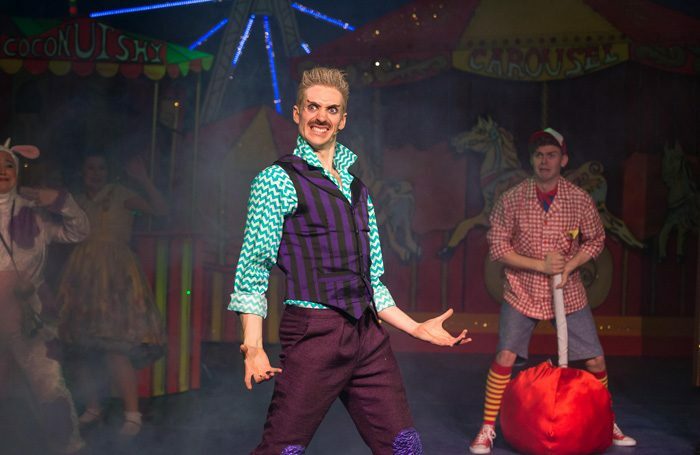 Though the fairground setting allows for some glittery, Willy Wonka-esque visuals, the unimaginative jokes and songs detract from the overall impression. James William-Pattison plays Jack, haplessly bouncing on his toes, driven by his altruism and dream of winning over Jill (Elizabeth Rowe) – a girl whose recent return from a finishing school which failed to quite “finish” her is an idea soon forgotten rather than imaginatively utilised. It’s a nice touch to have Claire Greenway’s bovine sidekick Pat eager to avoid being milked or eaten, but her irrepressible characterisation soon starts to grate. As Dame Dotty Trott, John Barr gets the most impressive costumes, but he sometimes whizzes through the jokes too quickly. The fact that Richard Emerson’s fairground owner Frank Furter is influenced of Boycie and Elvis largely pass over the audience’s younger heads. Some overly literal direction fails to fully play with the story’s scope for scale, though the cast’s live instrumentation of worn and more contemporary hits (Baby Shark Dance, anyone?) on the flimsiest of pretexts is impressive. The wittily-tattooed puppet giant’s enslavement of children and cruel taxes are mentioned only briefly, despite this being a dialogue-heavy panto; local references and up-to-date jokes are also inconsistent. The physical comedy is strong though, especially during the messy manufacturing of frozen yoghurt, and there are plenty of opportunities for kids to yell and fun to be had as the audience copies the choreography onstage.